I hate cords tangled up and disorganized so that you can't get any one free. These eliminate all that in an attractive and convenient to use way. I've used the velcro ones before and they're good but you have to fight them. These are simple and effective. Highly recommended. This was my second order of these cord ties. They are simply the best example of these type of items. I can’t say enough good things about them. Much better than a large rubber band.Easy to use around large cords. The Grommet does not disappoint and I love these wire ribbons to keep cords in place! I found these at a store while on a trip and instantly became addicted to them. And used them all up holding things together. I bought more here for myself and as presents for my family, all of whom love them. You can’t run out of ways to use them and can’t have enough!!! 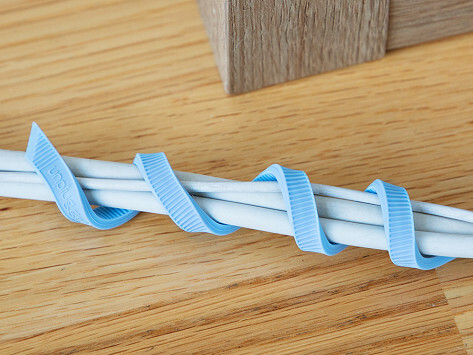 These are so easy to use, so flexible, yet have a strong hold. So happy I purchased them. They are much better than the Velcro wraps I have been using. gave both sizes, to my daughter as a gift and she was really anxious to try them out. Perfect for what she was to use them for.